As an incoming college freshman, sometimes it can all be overwhelming. From preparing for sorority recruitment to dorm decorating, your head might be spinning from everything you need to do in the short months before you head to your home away from home. 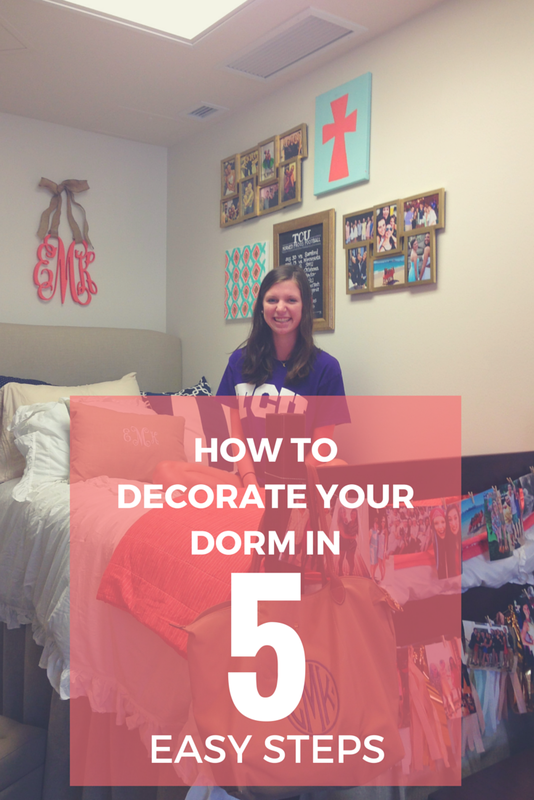 After decorating my dorm last year, I learned a thing or two about how to decorate my dorm in 5 easy steps. I hope this helps calm your stress and makes it a little easier to plan your new humble abode! First decide on a color scheme. This could be as specific as my color scheme which was coral and aqua, or it could be as broad as pastels. Deciding on this will make everything much, much easier. Next, decide on a style. I personally lean more towards a preppy style, but yours might be rustic, minimalist, hipster, etc. Go with whatever you usually find yourself liking. Do you shop at Urban Outfitters or J.Crew? Do lean towards antique stores or Target? All of this will help you decide what your dorm style is. Now you’ll want to establish a budget. Are you paying for your decor or will your parents be? Dorm decor can be as cheap as you want it to be (DIY) or as expensive as you’re willing to pay for (PBTeen). Start decorating with the basics. This includes a duvet cover, throw pillows, a rug, and curtains. Great places to find these include HomeGoods, Target, Ikea, Kohl’s, JCPenney, and PBTeen. These cover all price ranges, but there are so many other options online if you just search for it! Finish off the dorm room with the finishing touches. Add some wall decor, get your sheets and blankets, find a lamp and put a few picture frames on your desk. Now, wasn’t that easy? Dorm decorating doesn’t have to be as hard as you make it. All of those picture-perfect dorms on Pinterest could easily be recreated with these 5 steps if you just do a little searching and a little personal tweaking. Now get to shopping! Did you follow my steps? Do you have any other dorm decorating tips? Comment below!